The launching of a new division in the company leads to the launching of a new company website. Rebling Plastics was expanding their business to include manufacturing of a series of power connectors. With a company website already attracting visitors to learn about their battery components and custom moldings, Rebling only wanted to strengthen their business online by adding a new section to their website. DDA would provide custom website design and development to create a complementary site for Rebling’s power connectors. Like the main site, this section would include information regarding the various products Rebling offers and the applications they benefit. However, this new section would be more advanced in design and offer visitors a more user-friendly navigation experience. As part of our custom graphic design services, DDA created a unique site design that matched the tone Rebling wanted for their site. 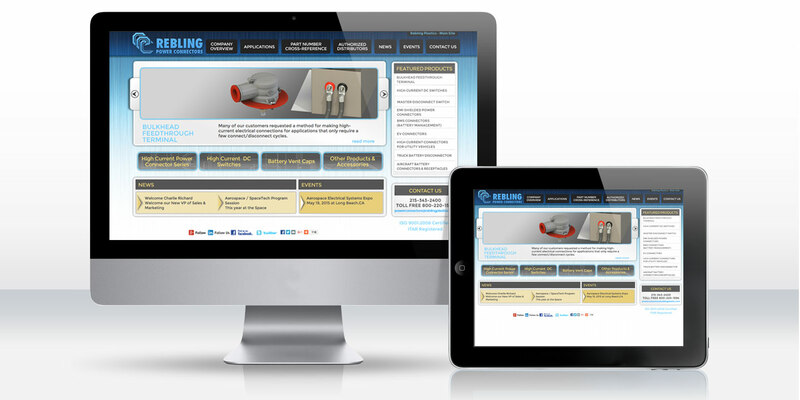 The design included a home page presentation of the different applications that benefit from Rebling’s power connectors and a separate rollover menu to overview the products Rebling offers. Once all the client-provided product images and detailed content were compiled and built-out, the power connector site was connected to Rebling Plastic’s main site (reblingplastics.com) in order to strengthen their search engine rankings. DDA also updated Rebling’s main site to include a link to the new power connector section. The Rebling Plastic’s website was now updated with a power connector section so the company could successfully launch their new product line.